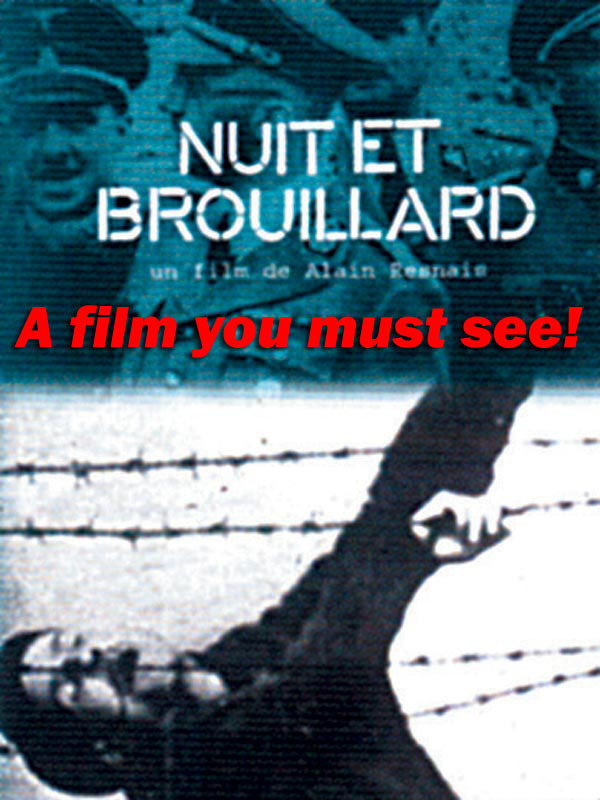 Night and Fog (French: Nuit et brouillard) is a 1955 French documentary short film. Directed by Alain Resnais, it was made ten years after the liberation of Nazi concentration camps. The documentary features the abandoned grounds of Auschwitz and Majdanek while describing the lives of prisoners in the camps. Night and Fog was made in collaboration with scriptwriter Jean Cayrol, a survivor of the Mauthausen-Gusen concentration camp. The music of the soundtrack was composed by Hanns Eisler. Resnais was originally hesitant about making the film and refused the offer to make it until Cayrol was contracted to write the script. The film was shot entirely in the year 1955 and is composed of contemporary shots of the camps and stock footage. Resnais and Cayrol found the film very difficult to make due to its graphic nature and subject matter. The film faced difficulties with French censors unhappy with a shot of a French police officer in the film, and with the German embassy in France, which attempted to halt the film's release at the Cannes Film Festival. Night and Fog was released to very positive acclaim and still receives very high praise today. It was then re-shown in 1990, to remind the people of the 'horrors of war'. I wrote a new score for this film. The idea came when somebody said that the Eisler music was too "happy". I did not agree with that, but I took the challence to write my musical view on this difficult subject. What I don't understand is why it was called Night and Fog. The Nazi's Night and Fog programs was primarily directed at non-Jewish French and other occupied citizens and consisted of surreptiously kidnapping them, then either killing them or taking them for slave labor in Germany and providing no explanation to their family and friends--hence Night and Fog. The camps were something different although some Night and Fog victims might have ended up in them.